25227 at Polmadie Works on June 28th 1978. The nineteen year seven month career of D7577/25227 included allocations to Scottish, Western and London Midland Region depots. Dual brake fitted (Dec 1977). October 1969 to Manchester Division (D09). October 1972 to Bristol (82A). 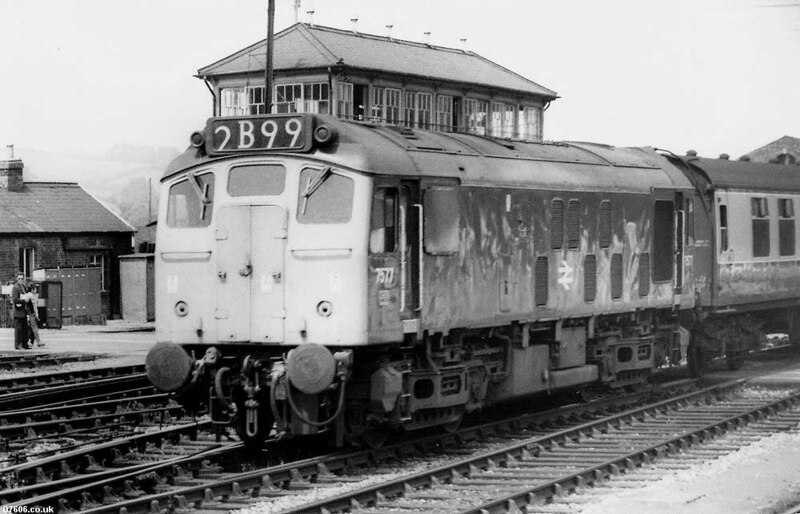 25227 was the 185th Class 25 to be withdrawn, one of three retired during June 1983. 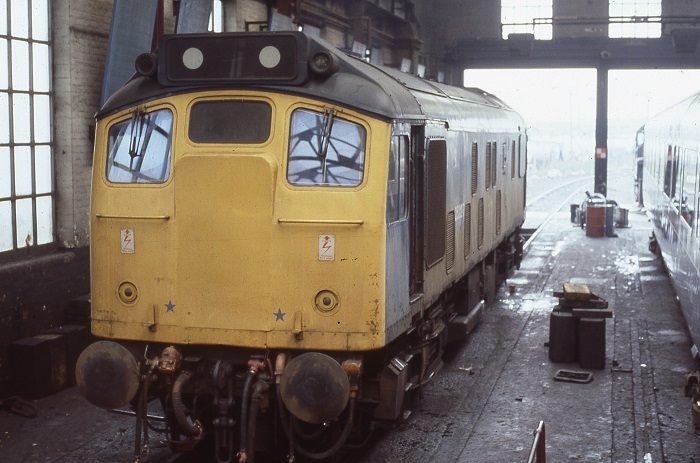 After withdrawal 25227 was stored at Cricklewood, then moved to Swindon Works from Acton Yard on August 23rd 1983 and was broken up at Swindon Works during the last week of December 1983. Noted Derby Works November 1964. Noted Glasgow Works October - December 1977 (Classified & dual brake equipment fitted). On Sunday March 7th D7577 was stabled at Holbeck along with D5184, D5251 & D7595. On the evening of July 25th D7577 was noted between Boston & Nottingham, presumably on a service from Skegness. Another early passenger working for D7577 took place on August 20th working the summer dated roundtrip Nottingham - Llandudno Town. with 7504. Condition July: green livery with small yellow warning panels, curved upper corners, no frame level stripe, gangway doors in place, blanking plates fitted, hand/footholds present, straight sided sandboxes, three-rung bogie mounted footsteps, engine exhaust located above engine room. Condition June: green livery with full yellow cab fronts, gangway doors in place, no blanking plates, hand/footholds present, straight sided sandboxes, three-rung bogie mounted footsteps. The 18.20 Crewe - Blackpool North was worked by 7577 on April 3rd. 7577 worked 1F51 21.30 Preston - Liverpool Exchange on the evening of June 4th. This was a frequent Class 25 turn. A lengthy day excursion on August 21st saw a roundtrip Nelson - Edinburgh worked by 7577 & 7569 for a total of 439 passenger miles. On September 28th a Manchester Piccadilly - Yarmouth was worked to Norwich by 7577 & 7589. Condition November: green livery with full yellow cab fronts, gangway doors in place, no blanking plates, hand/footholds plated over, straight sided sandboxes, three-rung bogie mounted footsteps, 'D' prefixes present. On May 6th 7575 & 7577 worked the 7B34 19.40 Bristol Temple Mills to Ponsandane freight, the 1E21 10.30 Penzance to Bradford passenger service to Plymouth, then light engines to Laira depot and ending with the 7B31 18.20 Plymouth Friary to Par freight. On May 20th 7502 & 7577 were noted at Long Rock shed whilst 7506 was at Penzance station. On July 15th 7502 & 7577 worked the 7B34 19.40 Bristol Temple Mills to Ponsandane freight, the 1E21 10.30 Penzance to Bradford passenger service to Plymouth, then light engines to Laira depot and ending with the 7B31 18.20 Plymouth Friary to Par freight. 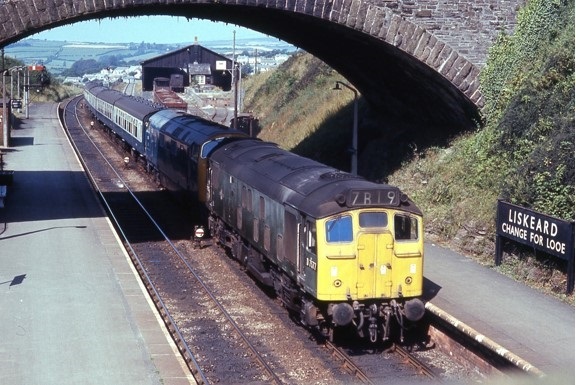 On July 22nd 7507 & 7577 worked the 7B34 19.40 Bristol Temple Mills to Ponsandane freight, the 1E21 10.30 Penzance to Bradford passenger service to Plymouth, then light engines to Laira depot where the diagram ended for 7577. 7577 was noted on the afternoon Hemyock milk train on August 1st. The Penzance - Leeds 'Cornishman' (1E21) with Warship 812 failed at Par on August 23rd, 7577 was added working through to Plymouth. At this time 7577 was allocated to Laira but would be transferred to Bristol during October 1972. Photograph courtesy of Gregory Fitzgerald. 7577 & 812 at Liskeard on August 23rd 1977 (see note above). On September 9th the 08.15 London Paddington - Barnstable was worked forward from Exeter St Davids by 7577, which returned to Exeter with the 14.40 Barnstable - London Paddington. On April 7th 7577 worked the 20.55 Exeter St Davids - Newton Abbot. Three days later (10th) 7577 worked the 20.10 Exeter St Davids - Newton Abbot. On April 14th 7577 worked the 15.55 Exeter St Davids - Barnstaple and the 17.55 return. On June 9th 7577 worked the 15.55 Exeter St Davids - Barnstaple and the 17.55 return. On June 16th 7577 worked the 09.51 Barnstaple - Exeter St. Davids and the return 12.20, then worked the 15.55 to Barnstable and the 17.55 return to Exeter. Two days later (18th) 7577 & 6547 worked the 15.58 Exeter St. Davids - Barnstaple. On July 14th, 20th & 28th 7577 worked the 15.55 Exeter St Davids - Barnstaple and the 17.55 return. 7577 worked a Bristol Temple Meads - Weymouth roundtrip on July 30th. Photograph courtesy of Ian Hammond. Exeter St Davids on June 16th 1973 as 7577 arrives with a service from Barnstaple. 25227 worked the 20.40 Exeter St. Davids - Newton Abbot on July 6th. On June 28th 25227 & 1027 were noted heading west at Par with an unidentified passenger service. Over the Christmas period Exeter stabling point contained eleven locomotives including 25227. The 20.15 Exeter St. Davids - Newton Abbot was worked by 25227 on April 19th. 25227 & 25225 were noted at Burngullo on July 12th with loaded china clay hoods. Condition September: blue/yellow livery, blanking plates fitted, hand/footholds plated over, ridge sided sandboxes, three-ring bogie mounted footsteps, No.2 cab front 2nd man's side - large patches of paint missing, centre lamp brackets and other fittings present. On October 2nd 25227 was noted at Newton Abbot with an unidentified passenger service, possibly an Exeter St. Davids - Paignton service. 25227 was noted on Aberdeen shed on April 2nd. The 12.44 Glasgow Queen Street - Dundee was worked by 25227 on July 25th. On August 13th 25227 worked the 08.44 Glasgow Queen Street - Dundee. The 23.45 Inverness - Glasgow Queen Street was worked by 25227 & 25241 on September 4th. On May 6th the Scottish Cup Final between Glasgow Rangers & Aberdeen took place at Hampden Park, with five specials scheduled. The 09.30am left behind 25072 & 25087, the 10.00am had 25227 & 25033 whilst the other three featured 40167, 40063 & 40159. 25227 was noted shunting at Elgin on October 30th. The 23.20 Glasgow Queen Street - Inverness on November 14th was worked to Perth by 25227 where 40062 took over with the combined Glasgow & Edinburgh portions. 25227 was involved in a debacle on November 27th involving the 09.45 Aberdeen � Glasgow Queen Street beginning when 47272 failed at Camperdown Junction, Dundee�s Class 08 pilot was first to assist but a vacuum fault rendered it useless, 26045 off a nearby ballast working brought the entourage into Dundee. 25227 had been procured to take the train forward but promptly failed and was replaced by 27032. This succeeded in becoming a partial failure near Perth, requiring assistance from 26036, finally departing Perth over one hundred minutes late. On December 9th the 20.10 Perth - Edinburgh was worked by 25227 & 25068, this being the Edinburgh portion off the 16.40 Inverness - Glasgow. On May 26th the 11.00 Edinburgh - Aberdeen was worked by 25227 & 27001. Also this day 25227 was recorded as working the 11.39 Dundee - Glasgow Queen Street (possibly the Aberdeen working has the wrong date?) On May 29th the 12.05 Birmingham New Street - Edinburgh was worked forward from Carstairs by 25227. The 06.40 Glasgow Queen Street - Dundee was worked by 25227 on October 27th. Later that day 25227 was assigned to a Dundee trip working, a northbound freight (five loaded coal wagons, six plate wagons and a brakevan). On December 14th the 08.20 Dundee - Glasgow Queen Street was noted arriving at Glasgow behind 25227 & 26029, its not certain where the Class 26 failed. The next day (15th) 25227 worked the 12.44 Glasgow Queen Street - Dundee. On October 28th 25227 & 27004 worked the 10.44 Glasgow Queen Street - Dundee and the return 13.39 Dundee - Glasgow Queen Street. The next day (29th) the same services were worked by 25227 & 25234. On December 14th the 08.20 Dundee - Glasgow Queen Street was noted arriving at Glasgow behind 25227 & 26029, its not certain where the Class 26 failed (Duplicate of 1979). The next day (15th) 25227 worked the 04.35 Edinburgh - Glasgow Queen Street and the 12.44 Glasgow Queen Street - Dundee (Duplicate of 1979??). The 14.44 Glasgow Queen Street - Dundee was worked by 25227 on December 23rd. On May 9th 25227 was at Oban station with a weedkilling train. 25227 was noted passing Drumochter in quite a storm on October 13th, there was snow on the higher elevations of the Highlands. On November 21st 25227 worked the 07.39 Dundee - Glasgow Queen Street, the 14.44 Glasgow Queen Street - Dundee and the 17.33 Dundee - Glasgow Queen Street. 25227 was noted with a loaded ballast train at Edinburgh Waverley on March 23rd. On April 3rd a Liverpool - Edinburgh service failed at Haymarket station behind 47703, 25227 pushed everything into Edinburgh Waverley. A week later on April 10th 25227 worked the 13.20 Dundee - Edinburgh. 25227 was at Polmadie wOrks on June 19th. Condition August: blue/yellow livery, blanking plates fitted, hand/footholds plated over, straight sided sandboxes, three-ring bogie mounted footsteps, No.2 cab front - blue star coupling symbols placed higher up than normal, centre lamp brackets and other fittings removed. 25227 was stabled at Motherwell on October 22nd, it would be transferred to Crewe by the end of the month. The Ellesmere Port � Riverside bitumen tanks continued to bring Class 25s to Exeter, 25227 & 25237 so noted on January 20th. On April 2nd the 'Annesley Annabis' railtour from Euston to Annesley Colliery was worked by 25227 & 25241 between Euston & Willesden No.7 signalbox. 25227 was withdrawn on June 26th 1983. Observed between October 1979 & May 9th 1981 with three-piece miniature snow ploughs fitted - may not be continuous time span. Page added September 8th 2013. Last update March 14th 2019.